Big, beautiful and wealthy, Bavaria's alpine landscape is a backdrop for some of Germany's most magnificent architecture and an economy bigger than Sweden's. It is Germany's largest state and covers almost one fifth of the country. Plus it has Munich, the Alps and those magical castles built by Ludwig II, Wagner’s festival, Oberammergau’s Passion Play and Germany’s highest mountain, the Zugspitze. 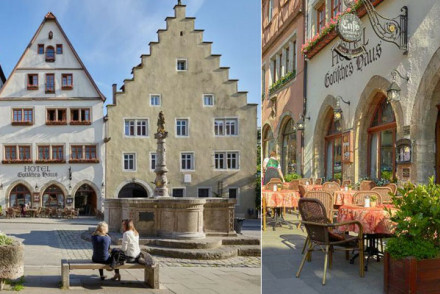 Our selection of the best places to stay in Bavaria offers something for everyone from budget B&Bs in the back of beyond to uber luxurious pads in amongst the bright lights and fun of the cities. Lively year round, Nuremberg really comes alive at Christmas time. This city grew wealthy as one of the capitals of the Holy Roman Empire, and unofficial seat of German Kings, but much of the medieval architecture has been replaced by Nazi built designs. Famous for its very dark beer, nightlife, wealth in art and its role in WWII, Nuremberg is one of Bavaria's biggest draws. Wagner started this festival himself, even designing the theatre, the Festspielhaus, and it's still introduced annually by one of his descendants. Built for the Prince Bishops of Würzburg in 1720, Napoleon called it 'the nicest parsonage in Europe'. The best French and Austrian architects and designers of the day ensured it was elegant and beautiful, full of detail but not overdone. Close to the Austrian border, this picturesque town sits on the convergence of three great rivers. So it's no surprise it was a very powerful trading position. The Holy Roman Empire built much of this pretty city, and it shows in the Italianate style. Bamberg's entire old town has been Heritage Listed by UNESCO. And it's generally considered to be Germany's most beautiful town. As well as architecture it turns out Bamberg's inhabitants also do a great smoked beer. There are still ten local breweries in town. Regensburg has been an important trading centre on the Danube for millennia, and its architecture is testament to the town's wealth and importance. Most of the really exceptional buildings went up between the 11th and 13th Centuries. And the Bavarian Alps and Schloss Neuschwanstein for the fairytale wonder of what can be achieved by one boy with a romantic imagination! If you like what you see you could consider walking King Ludwig's Way, a journey through some of Bavaria's most charming countryside from Lake Starnberg, past pretty villages, pale chalets, Orthodox churches, monasteries, cathedrals, two dramatic gorges and into the alps and Schloss Neuschwanstein. Signposted with 'K's, this route will take about five days, assuming you walk between 15 and 20 kilometres a day. 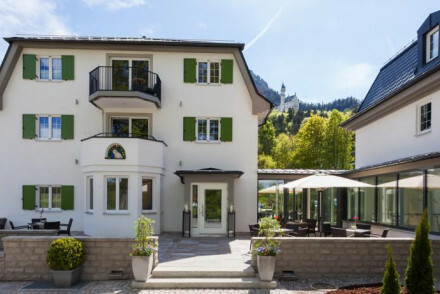 While exploring the Bavarian Alps you could stay in Oberammergau and hope to be there for its world renowned Passion Play - it takes place once every ten years, so you've plenty of time to plan ahead! If you’re visiting Munich start your explorations in the Marienplatz, which has some incredible architecture. Top that with a visit to Nymphenburg Palace which is dripping with architectural splendour - from a variety of classical periods - and breathtakingly ornate interiors. And spend an afternoon wandering around the English Garden (or Englischer Garten), a 900-acre park with 78km of hiking and cycling trails as well as a Greek temple, Chinese pagoda and Japanese tea house. Plus, there's even a beer garden. Of course. If you’re visiting Nuremberg, or even if you’re just passing by, most of us will feel it’s unfinished without a visit to the Palace of Justice, which now hosts a permanent exhibition charting the events leading up to the Nuremberg trials, the trials themselves, and their repercussions. Around 90% of Nuremberg was destroyed by Allied bombing during WW2, but after the conflict the decision was taken that instead of clearing the rubble and rebuilding a fresh city they would painstakingly restore the original buildings - a process which took almost forty years. Many monuments and buildings were salvaged, repaired and reinstated, so what you see is a patchwork of the city before the 40s. Including the Old Town, which is dominated by the castle, a group of fortified medieval buildings on a ridge overlooking the city. It, and its walls, were designed to represent the power and importance of the Holy Roman Empire. Nuremberg also has numerous impressive churches and the Germanisches Nationalmuseum, Germany’s largest museum of cultural history and one to many important paintings and artefacts. And the Tiergarten Zoo is one of the most beautiful zoos in Europe - situated on Schmausenbuck hill. 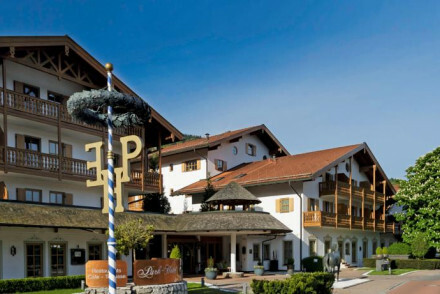 Use our guide to the best places to stay in Bavaria and start to plan your trip. The Hotel Splendid Dollmann is a townhouse turned chic hotel, with elegantly traditional accommodation harking back to another era. This charming property is also superbly located for exploring all that the city has to offer. The Anna Hotel is perfect for those who appreciate good design. Its interiors are sophisticated, there's an excellent restaurant and a trendy bar. Some of the suites have a private balcony. 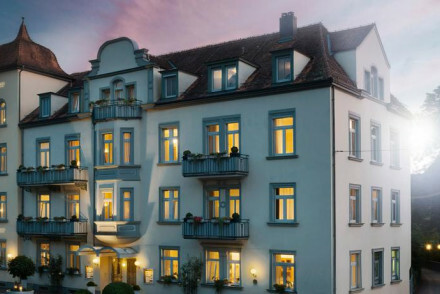 The Hotel Munchen Palace combines classical style with contemporary features, and has lovely rooms with creamy furnishings and private balconies, as well as a good restaurant. Subtle yet luxurious. The Hotel Konigshof is a sumptuous stay, offering romantic traditional accommodation, a Michelin starred restaurant and a wonderfully central location. A divine city spot. 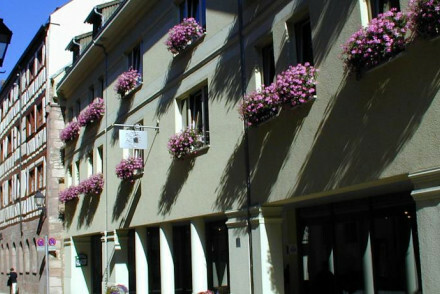 The Hotel Agneshof offers relaxed and homely accommodation in a quiet corner of the Old Town. The rooms are neat and comfortable and there is a welcoming bar and terrace garden. It's very convenient for the castle and surrounding sights. 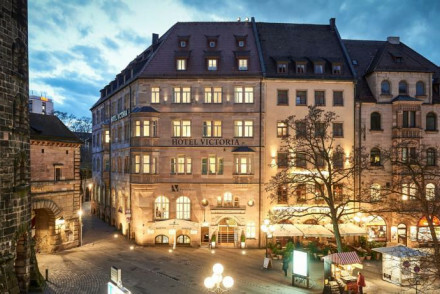 Right in the centre of town, beside the medieval Handwerfhof yard and close to the historic Lorenzkirche church, the Hotel Victoria is collection of 62 rooms and spacious suites, with a tea room, bar and private lounge. 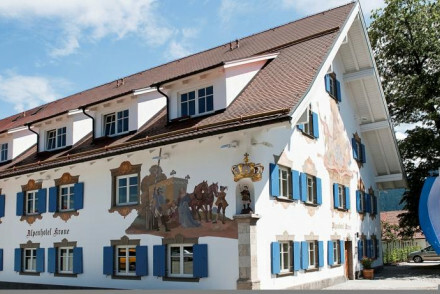 The Hotel Elch is a great value, family run hotel right by the castle. It’s been carefully converted from a timber framed, 14th century building and is full of historic charm - think all wooden floors but with stylish, modern rooms. 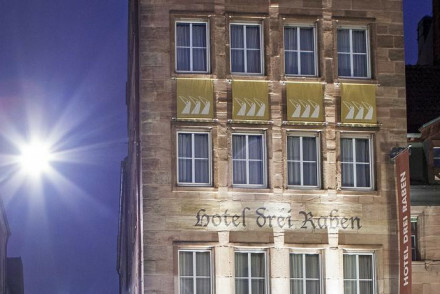 Close to Hauptmarkt Square, the Hotel Drei Raben is a quirky, theme hotel with 22 rooms each “telling their own story”. There’s a great, brightly lit cocktail bar and lots of restaurants, bars and cafes nearby. 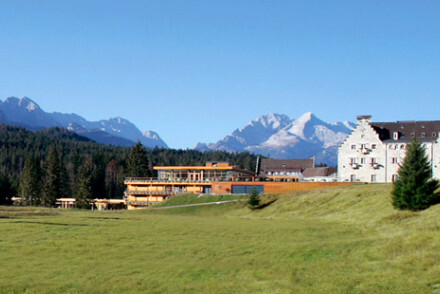 Schloss Elmau is an impressive spa resort in a beautiful valley just below the Bavarian Alps. There are 140 contemporary, relatively spacious rooms - most with glorious views. There are also a choice of spas - separated into ‘family’ and ‘adults only’, and three restaurants, one of which has a Michelin star. For something unusual, but surrounded by woodland, consider Hofgut Hafnerleiten, a collection of ten private villas in various sizes - the larger ones have kitchens. The property also has a freshwater lake, two saunas and two restaurants. They offer cooking courses, plenty of activities out in the fresh air and a chance to switch off. 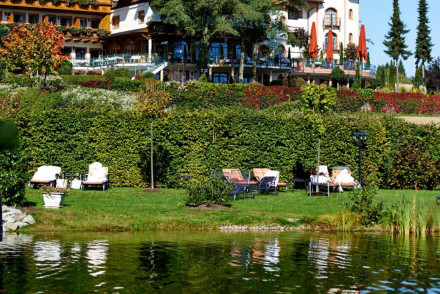 The Althoff Seehotel Überfährt is an elegant, lakeside property right on the shores of Lake Tegernsee. There are 176 light, contemporary rooms - many with private balconies and fabulous views, plus two pools, an excellent spa nd a gourmet restaurant. 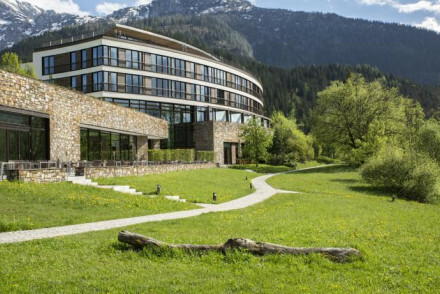 For tranquil surrounds and alpine views, the Bergkristall Natur & Spa is hard to beat. It has 49 light, contemporary rooms, and extensive spa, a gourmet restaurant and plenty of activities on offer to help you unwind, or just to enjoy yourself. 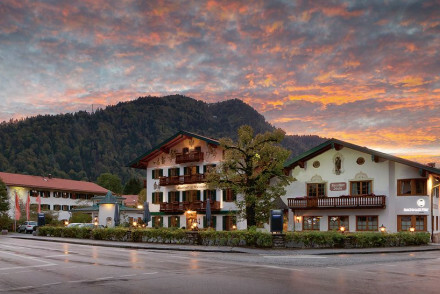 Oberammergau’s Hotel Maximilian is a five star option in the centre of the town. It's a pampering stay which ever season you choose to visit, with an onsite spa and gourmet restaurant specialising in Mediterranean cuisine. 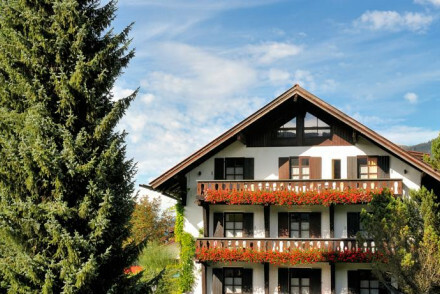 The Berghotel Schlossanger Alp is a wonderfully welcoming alpine hotel with 35 elegant, but cosy, rooms, wooden decor throughout, indoor and outdoor whirlpool baths, a Finnish sauna, a playground and a fantastic, regional menu. 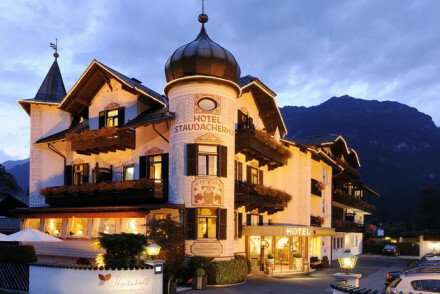 Oberstdorf’s Hotel Exquisit is a chic, luxurious hotel with gorgeous alpine views and 52 contemporary rooms and suites. It’s a modern hotel so expect a well equipped ‘wellness centre’, but there’s also a cosy restaurant specialising in regional, but modern, cuisine. You’re close to the alpine action here. 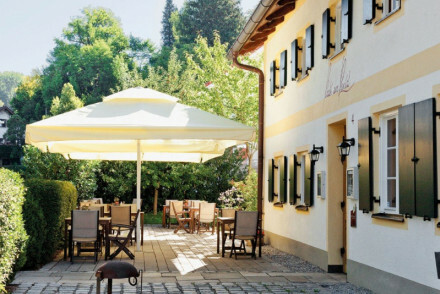 Just outside Würzburg is the Weingut Meintzinger, a charming hotel and winery with 29 comfortable, characterful rooms, all converted from a monastery. As well as easy access to Würzburg this is a great base for walking and hiking. The Hotel Nepomuk is a traditional, riverside property in beautiful Bamberg, with light, contemporary interiors and 24 rooms. The restaurant has a wonderful terrace which allows you to sit right out over the river and you’re within walking distance of all the main sights. In a beautiful Baroque building in the heart of old town Regensburg, the Hotel Orphee is a 25 room hotel with four poster beds, crystal chandeliers and many period features. They also have a popular French bistro and an excellent wine list. 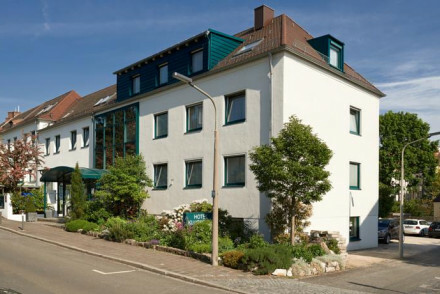 The Hotel Klughardt is a relaxed, homely B&B in Nuremberg, with a warm, welcoming atmosphere. You’re outside the centre of town, but there’s plenty of free parking and there are cafes and restaurants nearby. 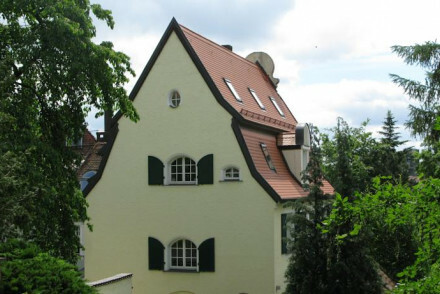 Also in Nuremberg, the Villa Giulia is a comfortable, self-catering or B&B apartment. 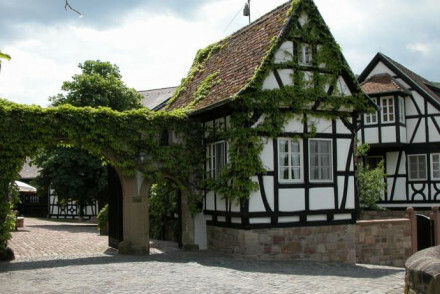 The house can accommodate up to eight, with plenty of space for kids, and you’re just a 15minute walk from Nuremberg Castle. There are cafes, bakeries, restaurants and food-markets close by. 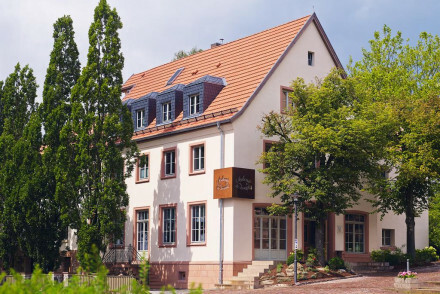 Right in the heart of Würzburg, the Hotel Gruner Baum is a 24 room hotel in the local, Franconian style, with pine furniture and an excellent buffet breakfast. 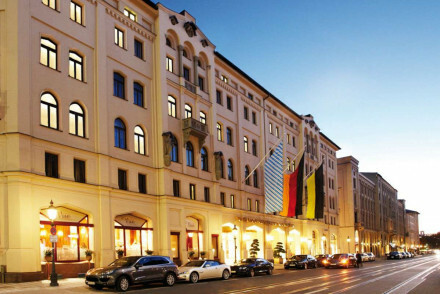 The Bayerischer Hof Munich is a truly fabulous stay. The rooms are luxurious, there's a rooftop spa, a private cinema and a nightclub. What's more, there are no less than six restaurants to choose from, including the Michelin-starred Atelier. 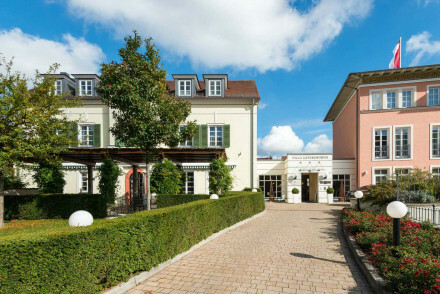 Lake Constance’s Villino is a luxury boutique hotel on the mainland just opposite the island of Lindau. The place oozes style and sophistication and the restaurant is award winning. Cookery lessons and wine tastings with the sommelier are available. Perfect for foodies or simply those who want to explore the region from a sumptuous base. 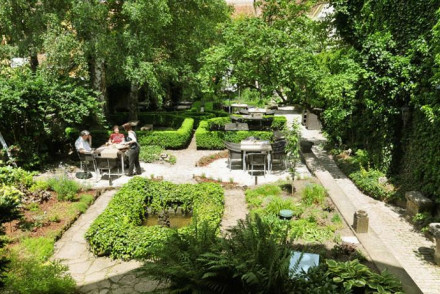 Furstenhof is a charming 3 star hotel in Landshut, with an award winning restaurant that specialises in gourmet seasonl dishes championing produce from small local suppliers. There's also a cookery school on site. Hermann's Romantik Posthotel in Wirsberg is another option for all serious foodies. Its Gourmet Restaurant Alexander Hermann holds two Michelin stars, but there's also a more relaxed bistro serving excellent Franconian dishes. 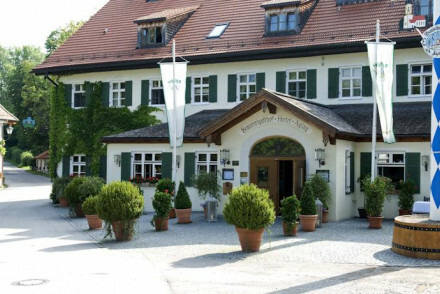 In a quiet residential district just outside Munich, the Laimer Hof is a charming 19th century villa turned B&B, which has been welcoming guests since 1937. Family run, it offers twenty-three fresh, simply decorated bedrooms, each slightly different. 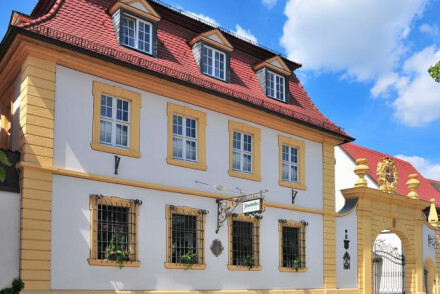 You might think of Bavaria more as a beer destination than a wine one, but Franconia, of which Würzburg is the capital, may change your mind.Just outside Würzburg is the Weingut Meintzinger, a charming hotel and winery with 29 comfortable, characterful rooms. All converted from a monastery. As well as easy access to Würzburg this is a great base for walking and hiking. 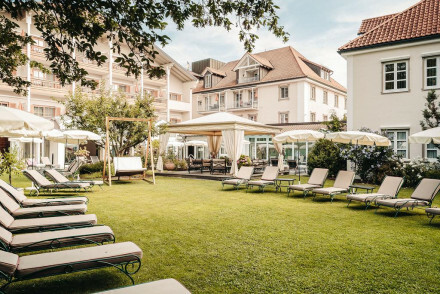 Lindau’s Hotel Spiegel Garni is a charming, family-run home in the heart of Lindau with just seven smart, comfortable rooms - some of them family suites - plus a wonderful sit-out terrace with beautiful lake views. Rooms start from around €120 per night including breakfast. If you’d prefer to stay in an apartment or private house we recommend you visit our online partner, booking.com. Depending on your route you can enter Bavaria by plane via Munich Airport, Frankfurt Airport or Nuremberg Airport. It’s relatively easy to explore the region on Germany’s rail network, and it’s possible to arrive by train from Austria, France, the Netherlands, Italy and the Czech Republic. If you want to hire a car - which we highly recommend if you’re staying in Bavaria - we recommend you visit our online partner, Rentalcars. If you’re here for the snow then check your resort for the very best time to visit, otherwise Christmas is very special, and Oktobefest is world famous, but if you want the most pleasant weather for your visit then you’ll probably want to visit between May and September. And March and May if you want to avoid the summer visitors entirely. 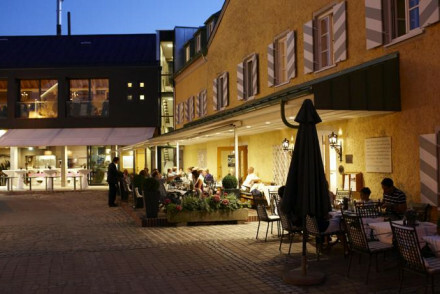 or the best places to stay in Lindau? 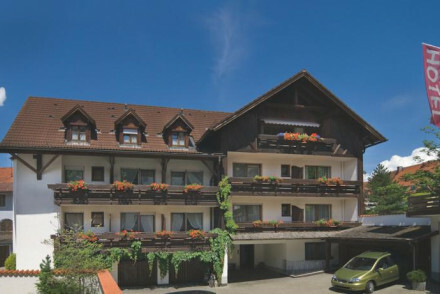 A cheery 3 star hotel has spacious, functional rooms decorated in a contemporary Alpine style. Be sure to try their beer brewed on site whilst enjoying a meal in the restaurant. Plenty of local cycling and hiking during the summer with skiing on offer in the winter. A good value stay. Foodies - They have a great restaurant serving local dishes and even brew their own beer! 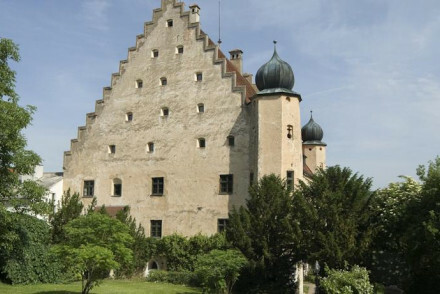 A wonderfully historic schloss nestled in the tiny Bavarian village of Eggersberg. 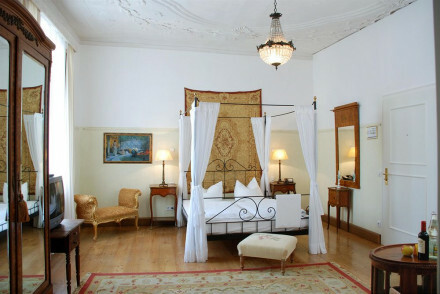 The individually decorated rooms exude charm and heritage with antique furnishings, ornate beds and classical furniture. Ideal for those who want a unique stay at a traditional German schloss. Romantic Break - A unique and historic hotel in the scenic Altmühltal valley offering Renaissance-style dinners and romantic gardens. Great walks - Great walking routes in the Altmühltal valley and through the property grounds. Sights nearby - Visit the UNESCO World Heritage old town of Regensburg. 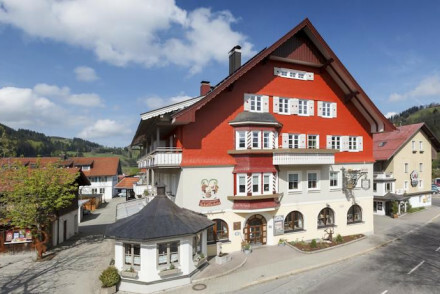 A charming 4-star family run hotel in the heart of the Bavarian countryside. 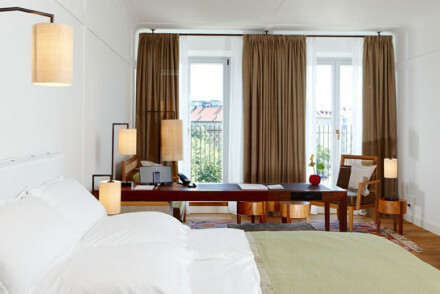 Beautifully designed rooms mix Bavarian traditional styles with contemporary design. Find a host of outdoor pursuits from hiking to cycling and spoiling spa to return to. An idyllic rural escape. Spa breaks - The spa has a Finnish sauna, steam room, solarium and a range of massage and beauty treatments. Cooking classes - Learn to cook dishes of the region with the hotel chef. 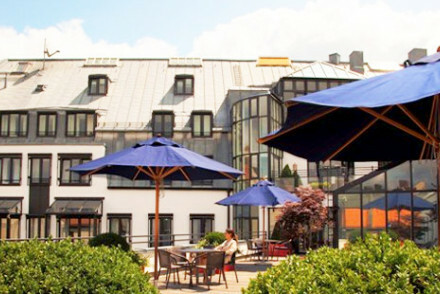 Smart, modern hotel in the centre of Munich with comfortable rooms, an excellent restaurant and on-site spa facilities. As you'd expect from the 25 Hours brand, interiors are quirky and range from single box rooms to exotic suites. A great affordable choice for a city break in a lively part of town. Sights nearby - Ten minutes walk from Frauenkirche and Marienplatz & Town Hall. 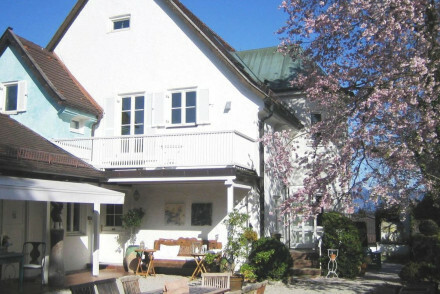 A charming property set in the pretty town of Fussen. Contemporary rooms are light and airy with parquet flooring and simple sleek furniture. Bavarian specialities served up in the restaurant. Plenty of outdoor activities to suit everyone. Well priced and laid backed. Ideal for families. 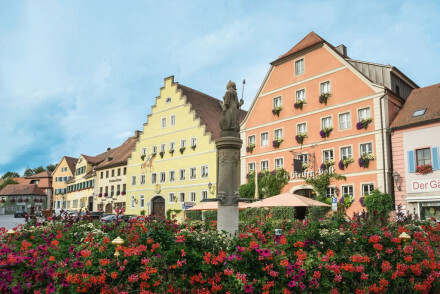 Local exploring - Located in the Old Town of Füssen and with a multitude of sights to explore nearby. Active Holiday - The surrounding countryside makes for wonderful hikes or cycles. Sights nearby - Visit the fairytale style Neuschwanstein Castle. 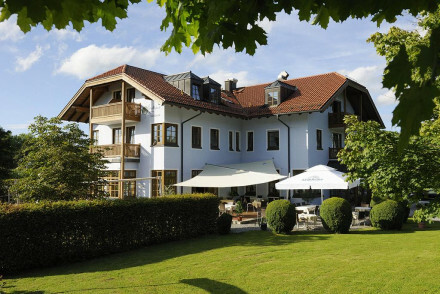 An elegant hotel in the heart of Bavaria surrounded by glorious countryside. Spacious rooms are traditionally dressed with plenty of pine wood and exposed stone. Spend days unwinding in the expansive spa, riding the property's horses or exploring the region by foot. A tranquil rural escape. Spa breaks - The 10,000 square meter wellness centre includes a sauna, gym, whirlpool, liquid pool, beauty treatments and yoga. Riding - There is a stable with over 20 horses that guests are able to use on request, while children go free! 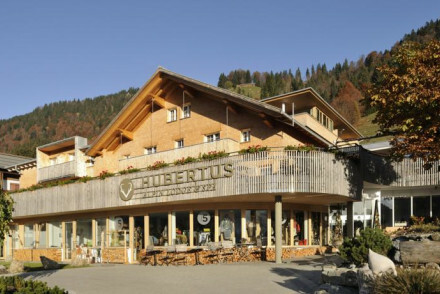 Foodies - There are 2 restaurants on-site serving a mixture of traditional Bavarian and international cuisine. Simple, homely accomodation with a relaxed atmosphere; perfectly located in a quieter spot in the beautiful old town. Bedrooms are comfortable and neatly furnished. A great little lobby bar and peaceful garden terrace. Ideal for those looking to get out and explore this charming city. City Style - A sleek choice, quaint cobbled lanes leading to a clean cut contemporary hotel with courtyard garden, hot tub and sauna. Local markets - Ideally located for Nuremberg's Christkindlesmarkt, be sure to check it out if you're here in winter. Sights nearby - Just a seven minute walk along cobbled lanes to Nuremburg Castle. Great walks - Wander the historical stone corridors in the castle district. 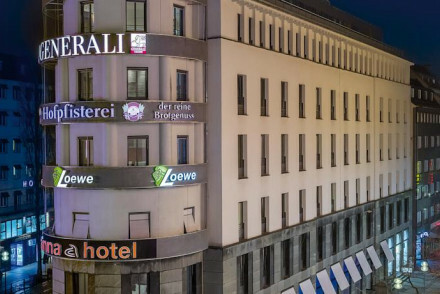 A contemporary hotel with an excellent business centre in Northern Munich. Sophisticated rooms and suites in blacks, whites and chromes have all the mod cons. Cosy bar, conference facilities and well located to get to the attractions. A great choice for business visitors. Sights nearby - Muenchner Freiheit, English Garden, and Chinesischer Turm. 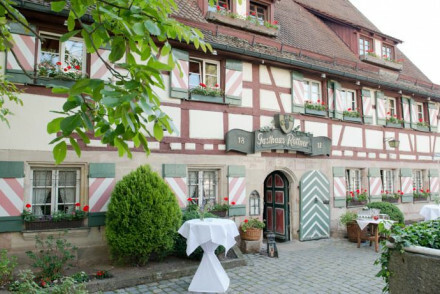 A simple family-run hotel, in the charming castle area of Nuremberg. Located in a 14th century timber framed house oozing with antiquated charm. The sleek wood floored bedrooms have a more contemporary, homely feel. A great spot for those interested in history and museums. City Style - A charming and historic 14th century timbered house, in Nuremberg's castle district, featuring stylish and modern rooms. Local markets - Nuremberg is famed for its Christmas markets, be sure to check it out if you visit in Winter. Great walks - Take a walk through Nuremberg's beautiful old town, wander along the picturesque castle hill. Sights nearby - Just a few minute walk to the lovely Nuremberg Castle, with splendid views of the city. 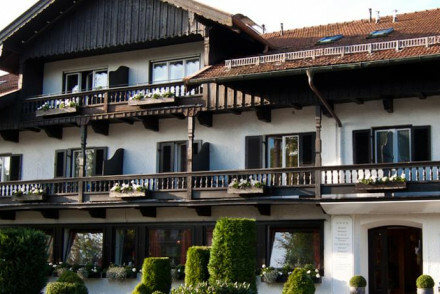 This stunning 600-year-old Bavarian hotel has spacious rooms furnished in an elegant and traditional manner. With many hiking and cycling paths nearby it's great for a spot of country exploring during the day before a relaxing meal at the superb restaurant in the evening. Be sure to visit the spa! 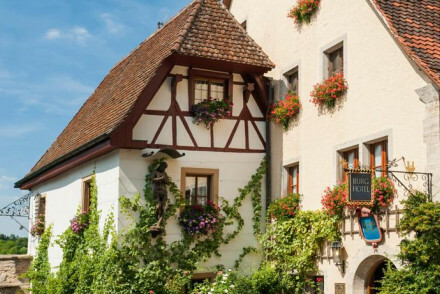 A romantic hotel in the heart of Rothenburg ob der Tauber. 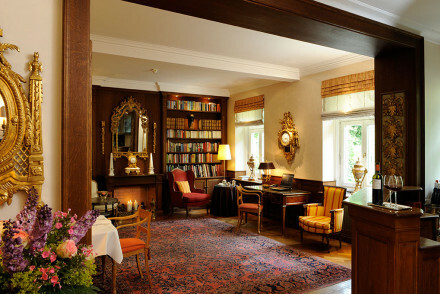 Atmospheric rooms are decorated with warm hues, antique furniture and chintz prints. Indulgent breakfasts are served in the library featuring exposed stone and timber clad walls. Walking distance to many of the town's sights. Charming. Romantic Break - A historic and wonderously romantic hotel. Ideal for a weekend away for two. 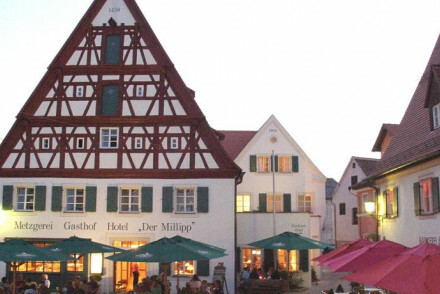 Local exploring - Step out of the front door and start roaming Rothenburg ob der Tauber. Sights nearby - Wander through the quaint streets and make sure to stop at St. Jakob’s Church. Local markets - During December be sure not to miss the excellent Christmas market. 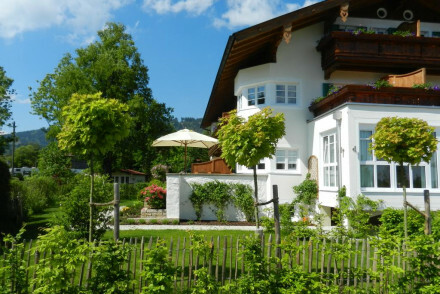 Elegant accommodation overlooking the stunning Lake Tegernsee. Rooms combine contemporary and traditional design to great effect. Return to a drink in the atmospheric bar after a day spent hiking in the surrounding mountains. Ideal for outdoor enthusiasts. Back to Nature - Overlooking Lake Tegernsee, many rooms have stunning balcony views. Business meetings - The hotel has multimedia-equipped meeting and banquet facilities. A beautiful 19th century castle surrounded by rolling gardens and woodland. Individually decorated rooms are spacious and comfortable with fine parkland views. Its big focus on weddings makes it a lovely place to get married. 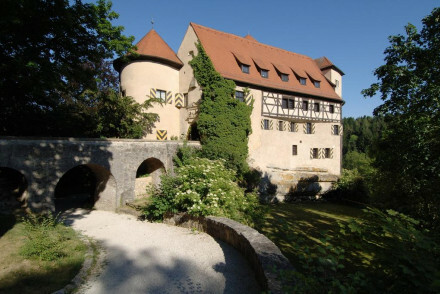 Country Escape - A romantic country escape in a castle in Aichach surrounded by lovely woods and landscaped gardens. Great walks - Great walking routes from the hotel through the surrounding Bavarian countryside. Sights nearby - Take a day trip to Augsburg Botanical Garden or Augsburg Zoo. A designer chic boutique with spacious loft studio suites. A very cool industrial space conversion decorated with stylish eclecticism. Suites have private balconies, views of the Alps and all the mod cons. A lively roof-top terrace bar is a popular spot. A great choice for a young couple. Roof terrace - Roof top terrace bar with a wood-fired oven and a delicious drinks menu. Designer - Spatial industrial style renovated with cutting egde eclecticism. Lively - The bar is a lively spot. 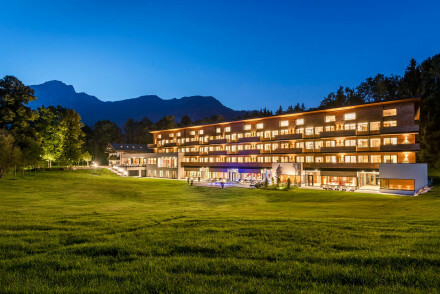 Luxurious 5-star hotel in the resort of Oberstdorf with scenic mountain views. Spacious rooms feature floor to ceiling windows, light pine furniture and contemporary bathrooms. An atmospheric restaurant serves up hearty fare along with a choice selection of wines. Ideal for outdoor enthusiasts. Spa breaks - The wellness centre includes two saunas, a steam bath, whirlpool and a range of treatments. 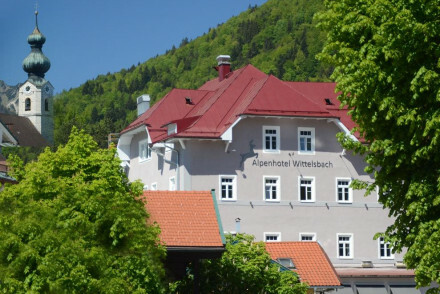 A charming hotel set in the historic town of Berchtesgaden. Spacious rooms are traditionally dressed with light wooden floors, pine furniture and exposed beams. Sumptuous breakfasts are served and there's a small spa and sauna. An ideal base for accessing the stunning surrounding national park. Back to Nature - Surrounded by stunning scenery this is the perfect spot to reconnect with nature. Renovated 15th century abbey in the heart of Odenwald Natural Park. Traditionally dressed rooms are light and spacious. Spend days exploring the surrounding landscape before returning to hearty cuisine and the indulgent spa. A rejuvenating stay. Writing a novel - Secluded by the forests of Odenwald, this is an idyllic place rich in spirituality and history, perfect for writing. Spa breaks - The wellness centre offers a range of treatments, as well as having a sauna and gym. Stunning 3-star family run hotel in Landshut offering elegant accommodation and a fabulous restaurant. Classically styled rooms feature large windows, warm hues and sink-into beds. Ideally positioned to explore the region. Romantic Break - The rooms are romantically-adorned, with antique furniture and bright interiors, boasting stunning views of the town. Foodies - Feast on exemplary Bavarian cuisine in the award winning restaurant. Sights nearby - St. Martin's Church has the tallest brick tower in Europe and scrapes the city's skyline. Cooking classes - Cooking classes can be booked via reception at the in-house cooking school. 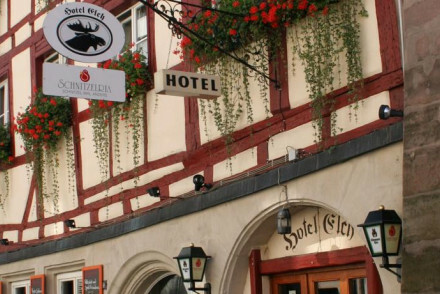 This traditional hotel is situated in the heart of Volkach. The restaurant serves delicious cuisine accompanied with wines produced in their own vineyards whilst they also have a distillery which is worth a visit. Go hiking and cycling to truly explore this quaint region or relax in the spa. A charming traditional hotel run by the same family for generations. Cosy rooms with beamed ceilings, crisp white linen and classic wooden furniture. Award-winning regional cuisine and a beer garden to unwind in after a day outdoors. Within easy access of the Altmühltal Nature Park. A quaint spot. Local exploring - A historic building in the heart of Beilngries within easy access of the surrounding countryside. A true Bavarian experience. Great walks - Explore the scenic countryside of Altmühltal Nature Park. 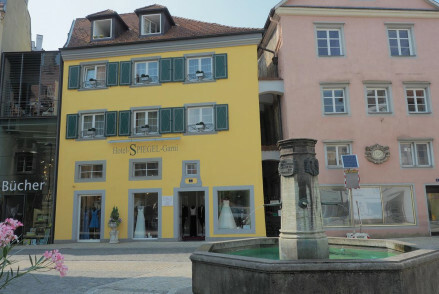 Charming family-run hotel in the heart of Lindau's island. The seven smart rooms are traditionally styled, most are spacious and comfortable with some offering seating areas where guests can relax. An excellent base for exploring Lindau and Lake Constance. Great value too. Sights nearby - Ten minutes walk from Lindau Lighthouse. Local markets - Two minutes walk from Lindau Markt. A privately run hotel and art gallery where creativity creeps into every crevice, from the garden to the cuisine. The beautifully designed rooms are light and airy. 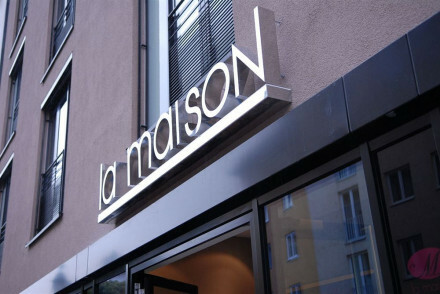 The owner and chef serves up delicious mediterranean cuisine, best enjoyed in the summer outside overlooking the Alps. Bliss. Active Holiday - A host of outdoor pursuits to be enjoyed in the surrounding mountains and countryside. Sights nearby - Check out a number of nearby castles, including Ludwig II Neuschwanstein and Hohenschwangau. 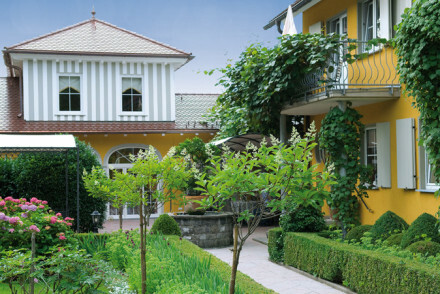 A charming hotel and winery in the quaint Bavarian village of Frickenhausen. The rooms blend modern aesthetics with traditional furniture, making them both comfortable and characterful. Sample the hotel's wine in the atmospheric wine cellar. Perfect for a fun weekend in Bavaria. 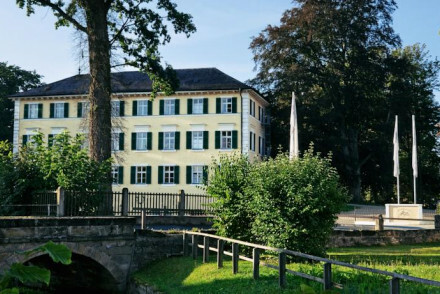 Local exploring - Explore the history and culture of this fascinating former monastery, in the village of Frickenhausen on the River Main. Sights nearby - Take a day trip to Würzburg and visit the Old University, Botanic Gardens and Cathedral. Great walks - Great walking opportunities around Meintzinger with lots of well-signposted hiking routes. 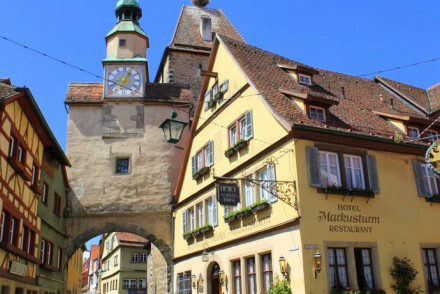 A perfect base to explore the historic town of Rothenburg with stunning views to be enjoyed over breakfast and features a range of spacious rooms, suites and villas. 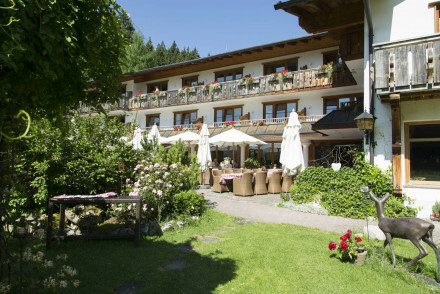 Enjoy its extensive spa facilities, relax in the monastery's garden or rent a bike and go explore the Tauber Valley. A rural idyll. 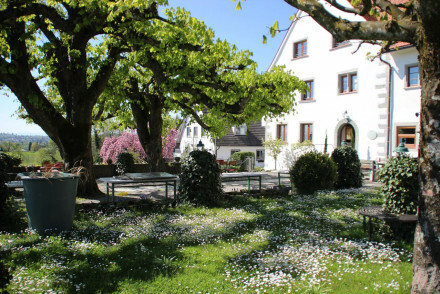 Cosy and romantic accommodation in Feuchtwangen. Rooms are cosy and bright, with warm colours, antique furniture and rustic furnishings. Facilities include a restaurant, library, spa, heated indoor pool, games room and free bike hire. A charming base to explore the region from. Spa breaks - The spa includes a hammam, sauna, steam room, indoor pool, a range of massages and Ayurvedic treatments. Foodies - Boasting a restaurant that's received awards for its regional dishes. Cooking classes - Learn to cook local dishes in the hotel's cookery classes. A characterful property in the heart of Coburg. Brightly coloured, individually styled rooms, feature large windows, contemporary furnishings and wonderfully comfortable beds. A well stocked wine bar is the perfect spot to enjoy an evening drink plus a steak seafood & sushi restaurant. Very smart. Local exploring - A historic building well positioned within walking distance of many of Coburg's best sights. Sights nearby - Visit the stunning 13th century Veste Coburg castle. Family-run hotel in the centre of Parsberg. Bright, cheerful rooms are individually decorated, each with a unique abstract painting. The restaurant serves delicious regional dishes made from fresh local produce. Perfect for exploring the pretty countryside of Oberpfalz. A traditional Bavarian property boasting glorious views over the picturesque mountains. Spacious rooms are light and airy with large sash windows, simple decor and soft hues. A cosy restaurant serves up local dishes. A delightful base to return to after a day spent in the outdoors. Active Holiday - The surrounding mountains offer a plethora of outdoor pursuits. Villa Giulia is a homely, comfortable apartment offering self catered accommodation with a bed and breakfast option. The house has a full kitchen and a small sitting room. Perfect for those looking to get out and explore Nuremberg. Families - This self catering eight person apartment is ideal for families, with plenty of space for kids to run around. Sights nearby - A 15 minute walk will bring you to the Nuremberg Castle, boasting excellent views over the city. Local markets - There are bakeries, foodstalls and restaurants within a three minute walk of the apartment. Great walks - Wander around this leafy residential area, and enjoy the peace a quiet. 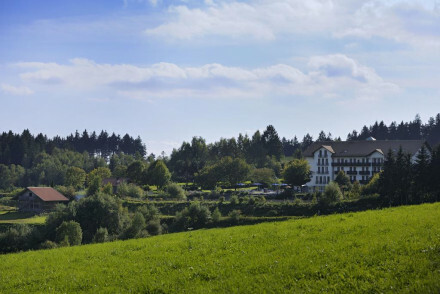 Overlooking Lindau and the surrounding lake, Montfort Schlossle is a tranquil, countryside hotel. Surrounded by leafy green trees and beautiful vistas, it's a great spot for a relaxing, romantic retreat. Sights nearby - Visit the interesting Lighthouse Lindau. A family run 4-star hotel housed in a historic brewery. Well proportioned contemporary rooms with parquet flooring, simple furnishings, soft hues and crisp white linen. 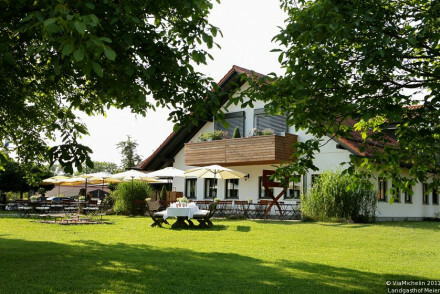 A cosy Bavarian restaurant complete with open fireplace and easy access to the picturesque surrounding countryside. Bavarian bliss. Local exploring - A historic building in the centre of Beilngries, with easy access to the town's sights and countryside pursuits. Great walks - Hike along the river paths by the Altmühl and through the surrounding meadows. Sailing - Take a boat out on the lake in Altmühl Natural Park. A beautifully renovated 17th century patrician's house, in the heart of the medieval Altstadt, with lots to explore out the front door. Comfortable rooms with contemporary interiors, spacious living areas and balconies. The courtyard terrace and restaurant are fun places to hang out. Local exploring - Located in the heart of the historic centre with easy access to all tourist spots. Local markets - Wander out of the front door and check out the various shopping oppotunities in the area. Sights nearby - The Gothic Minster of St. George and the House of History cannot be missed. 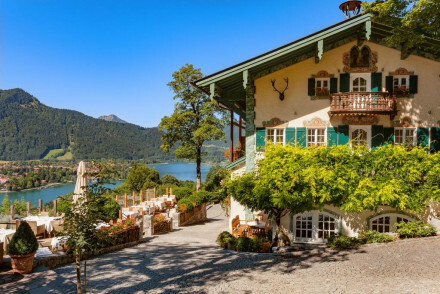 Set in a stunning location beside a sparkling lake near the Bavarian Alps, this charming property offers 11 cheerful, individually designed rooms adorned with oak floors. From winter sports to summer activities, there's fun for all ages. Ideal for families, couples and anyone who loves the outdoors. A traditional riverside property with contemporary interiors. Simple light rooms with clean lines and modern bathrooms. Local cuisine is served at the restaurant which features a terrace sat in the middle of the river. Walking distance from most of Bamberg's sights. Ideal for local exploration. Local exploring - Well situated in the world cultural heritage city of Bamberg. Sights nearby - Admire the medieval architechture of the historic city. Sailing - Take a romantic gondola ride along the Regnitz. A stunning 13th century building in the heart of medieval Rothenburg. All the rooms come with antique furnishings and a rich buffet breakfast is served every morning. With family rooms and babysitting services available it's perfect for a family break. Local markets - Only a few minutes walk away from the local market-especially worth a visit at Christmas time! 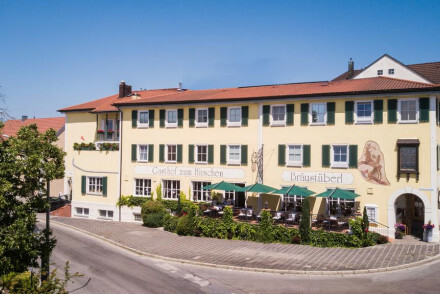 A 4 star hotel in an 18th century building offering chic rooms within the original structure which features exposed wooden beams and typical Bavarian fresco paintings. Interiors are modern with lovely design elements and full comfort. The in house restaurant serves local and international cuisine. Total relaxation - The relax and wind down zone features a spa, massage centre, steam and sauna focusing on complete relaxation of mind and body. Local exploring - In a very central location, easy to explore the surrounding castles and cities. Sights nearby - Explore the cosmopolitan city of Munich for its art, culture and modern lifestyle. An elegant property in the heart of Bad Aibling. Simply styled light and airy rooms with luxury bathrooms. 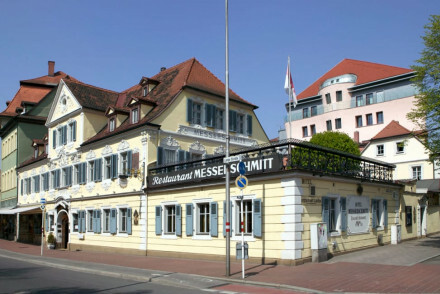 Hearty, organic, Bavarian cuisine and a traditional bar. Numerous outdoor activities in the surrounding area. A charming property. Active Holiday - With easy access to the Alps and the many outdoor pursuits they offer. Sights nearby - Visit the fairytale styled Herrenchiemsee castle. 4-star accommodation in Schonwald offering facilities including a wellness centre, tennis court, heated indoor swimming pool and a restaurant. Cosy rooms are traditionally dressed with warm hues, sink-into beds and light wooden furniture. An ideal base for outdoor enthusiasts. Spa breaks - The wellness centre includes a sauna, heated indoor swimming pool and a range of massage and beauty treatments. Active Holiday - A ski and golf area located close to a ski lift and 3km from a golf course. Great walks - Take a scenic walk to the Triberg Waterfalls. A charming traditional property and winery in the medieval town of Iphofen. Elegant rooms boast antique furniture, traditional paintings and chintz wallpaper. Sample fabulous Franconian cuisine paired with the hotel's own wines. A delightful spot to unwind and explore the surrounding area. Local exploring - With easy access to city sights as well as the surrounding vineyards there's plenty to keep one entertained. Great walks - Start your day with a brisk walk through this stunning landscape. A family-run luxury hotel with two contrasting properties; the first is a historic timber framed guesthouse and second a contemporary hotel. Spacious rooms are simply designed in a county-house style. Enjoy Franconian specialities served in traditional surrounds. Just 20 mins from Nuremberg. Local exploring - A country property just 20 minutes from Nuremberg giving the best of both world's; city and countryside. Cooking classes - Take part in the interactive courses at the hotel's Siemens Life Cookery School. Great walks - Head off to explore the coutryside, with many tracks and trails nearby. Sights nearby - Make a trip to the imposing Nuremberg castle. 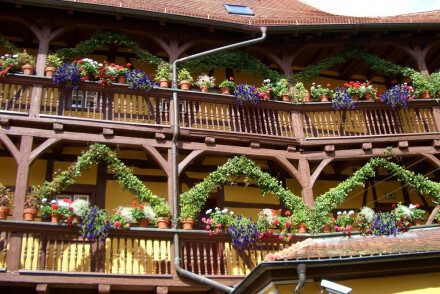 Unpretentious accommodation, fantastically located in the Nuremberg's charming Old Town. Colourful bedrooms and larger spacious suites with private lounge area. A tea room and bar are open to hotel guests. With meeting rooms and a range of event spaces, the hotel can cater to a variety of needs. Romantic Break - For an enchanting romantic getaway be sure to take the suite, with lounge, balcony and views over Nürnberg’s old town. Local markets - Just beside the charming medieval crafts yard of Handwerkerhof, packed with German craft delights. Sights nearby - Just down the road from the medieval Lorenzkirche Church, steeped in history. 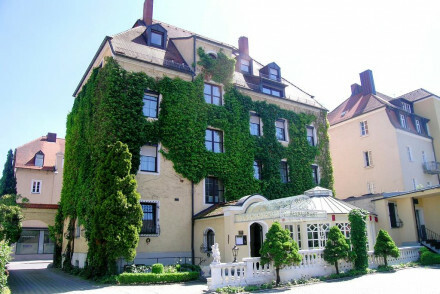 An old townhouse turned chic hotel, in the historic Lehel district. The plush rooms exude an understated elegance, with original artworks and fine fabrics. A sumptuous breakfast is served in the dining room or on the leafy patio. Ideally situated and bursting with charm. Local exploring - A super central location, right in the heart of the historic old town and within walking distance of restaurants and shops. 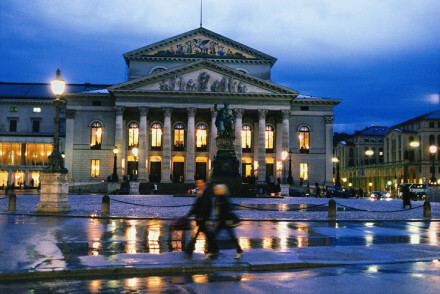 Sights nearby - The Bavarian State Opera and Munich Kammerspiele, Residenz Palace and Haus der Kunst are all within walking distance. 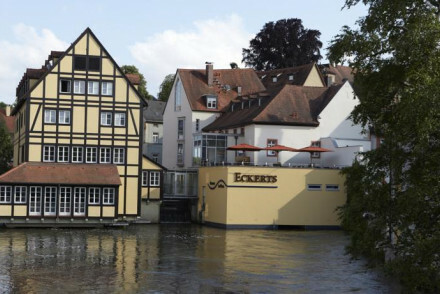 An elegant 4-star hotel situated on the picturesque banks of the old Ludwig-Danube-Main Canal on Geyersworth island in Bamberg. Nestled in the town's UNESCO-listed historic centre it boasts riverside walks ideal for couples' retreats, and offers fine dining in its private restaurant and terrace. Sights nearby - Popular attractions close to the Hotel Villa Geyerswörth include the Old Town Hall and Bamberg Cathedral. Great walks - Enjoy beautiful riverside walks along the banks of the old Ludwig-Danube-Main Canal. Chalet hotel in the centre of a town on the shores Lake Ammersee in Bavaria's Lake District. Spacious comfortable rooms and an award winning gourmet restaurant with a great wine list. 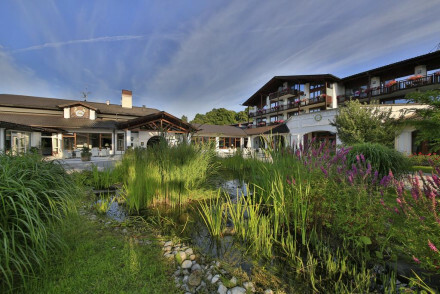 A stylish hotel which is ideally placed for exploring the area and a good stop over close to Munich. 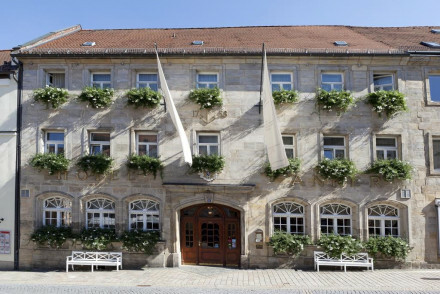 Traditional 18th century accommodation in the historic town of Bayreuth, offering elegant en-suite rooms. Boasting an excellent regional restaurant, coffee house, bike rental and concierge services. Ideally located to explore the town by foot. Local exploring - Set in the heart of the the baroque-style town centre with many of its attractions within walking distance. Foodies - Gourmet food is served up using almost all local produce. Sights nearby - The Markgravial Opera House is a 5 minute walk away. 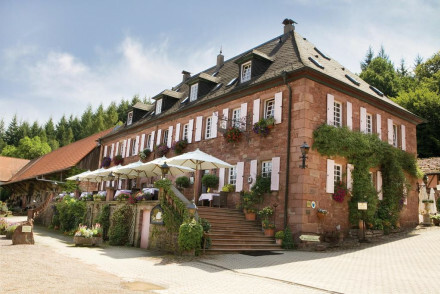 A chic, family run former coaching inn, located in the beautiful Frankenwald area. The hotel welcomes guests with a warm and charming atmosphere. Rooms are traditional-style with leather furnishings and wooden floorings, one with private sauna. A Michelin star restaurant and a special Spa Suite. 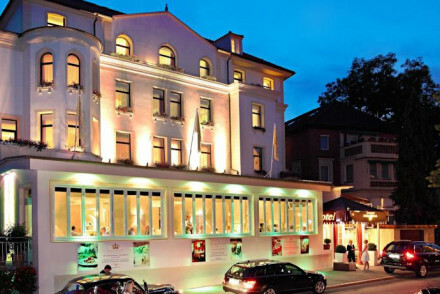 Foodies - The Alexander Herrmann Restaurant has been awarded a Michelin star for its creative gourmet cuisine. Local exploring - In a good location, within walking distance of most major sights in the town. Cooking classes - Take part in Gourmet Workshops by Alexander Hermann, well worth checking out. Sights nearby - Both the Plassenburg and the Hermitage castle are well worth a visit. 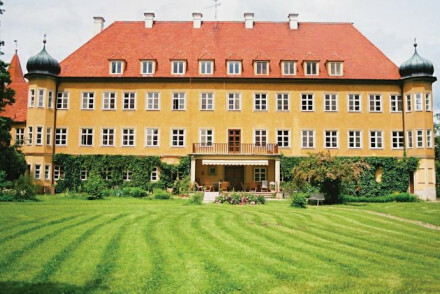 A beautiful schloss hotel, in the countryside surrounding Bamberg. Rooms are spacious and comfortable with tasteful furnishings and modern bathrooms. Enjoy Franconian specialities at the hotel's restaurant and in the summer try locally brewed ale in the beer garden. A delightful countryside retreat. 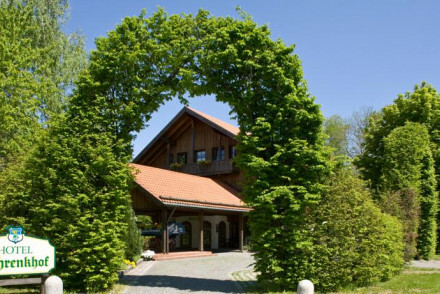 Country Escape - Situated on a large private park, close to many hiking and biking trails through the beautiful Franconian Switzerland region. Great walks - There are loads of local walking trails including the Frankenweg (The Franconian Way). Sights nearby - Visit the historic Bamberg with its Imperial Cathedral Kaiserdom. Cooking classes - Traditional cooking classes are available at the hotel. A charming hotel set in pretty gardens. Contemporary rooms with soft hues and large windows lend an air of calm. An indulgent spa and gourmet restaurant. Plenty of outdoor activities in the surrounding area. Ideal for a romantic break. Romantic Break - A charming and romantic spot in which to unwind with spa treatments, hot tubs for two and candlelit meals. Great walks - Spend a day hiking through Rhön National Park, a stunning animal filled reserve. Sights nearby - Make a trip to the Botenlauben Castle ruins, well worth the drive. Meticulously restored 19th-century inn. Stunning interiors and artworks pay tribute to local artists. All rooms individually decorated in glorious colour. Dine like royalty in a Michelin-starred restaurant, take a cookery class, view the in-house art gallery, or indulge in a relaxing spa treatment. 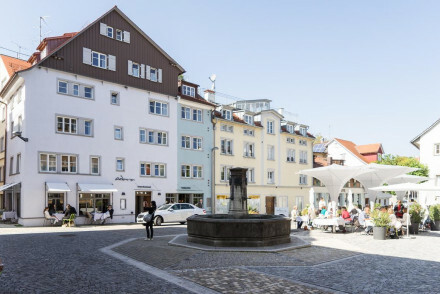 In the charming old town of Lindau, Hotel Adara is a boutique hotel and restaurant offering smartly designed, comfortable rooms which seamlessly blend period features and modern style. 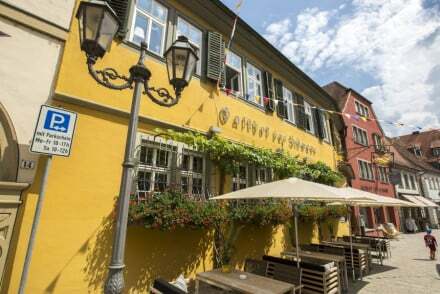 A great base from which to explore Lindau's historic town and the wider Lake Constance area. Local exploring - Right in the heart of Lindau, it's perfect for exploring the old town and the surrounding lake. Sights nearby - Visit the town's lighthouse as well as its town hall. A striking 800-year-old castle set within 64 acres of picturesque parkland. Characterful rooms are individually styled with antiques and traditional artworks. An atmospheric restaurant serves up hearty fare. Take a tour of the castle, explore the hiking trails or try your hand at falconry. Country Escape - An historic castle set in 64 acres of beautiful parkland. An idyllic rural getaway. 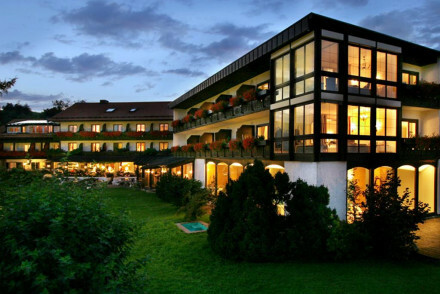 A gorgeous Bavarian hotel next to Lake Tegernsee and at the foot of the Alps. 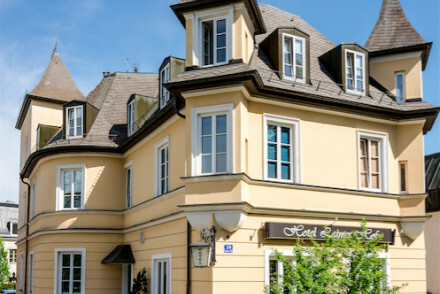 Traditional Bavarian style with muted modern elegance throughout creamy rooms and suites. Gourmet gastro-pub serves local delicacies, top of the range spa, and plenty of outdoor pursuits in the surrounds. 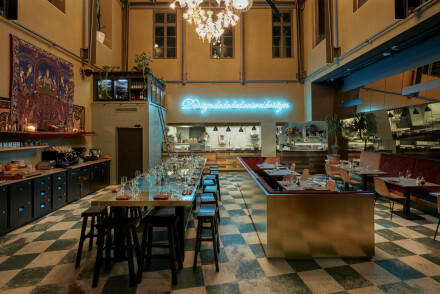 Foodies - Gourmet gastro pub serves Bavarian delicacies. Views - Beautiful lake and mountain views. Traditional - Old Bavarian tradition combined with modern elegance. A chic boutique hotel with a sophisticated tone. 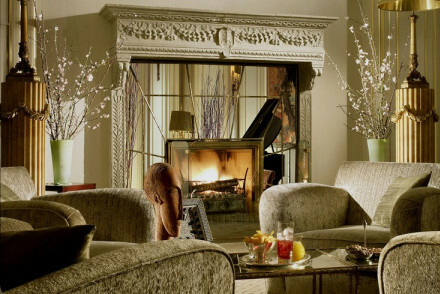 Parquet floors, killim rugs, solid elegant furniture and faux fireplaces in elegant rooms and suites. The bar and restaurant are lively hot spots. Lovely terrace and a gym. Understated cool. Lively - The bar is one of Munich's hotspots. 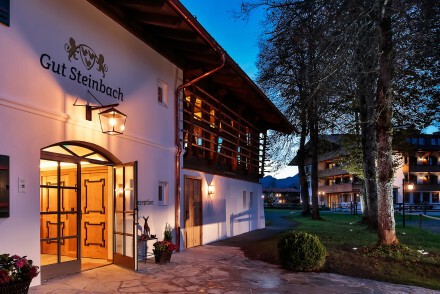 Fabulously located on the border of Austria, Germany and Switzerland, this is a luxury stop off point. Award-winning cuisine, boutique rooms and suites decorated with flair, cooking lessons, wine tasting, and a rejuvenating spa. Not far from the lake for all sorts of activities. Gourmet, romantic. Outstanding location - An amazing spot for travelling the region as Lindau sits at the crossroads of Germany, Austria and Switzerland. Foodies - Award-winning cuisine, cooking classes, and wine tasting from the sommelier. A charming hotel and restaurant set in the heart of Bamberg, a UNESCO Heritage Site. Individually styled rooms are light and bright with softly patterned fabrics, large windows and indulgent bathrooms. The restaurant specialises in locally caught fish and game. Ideally placed to explore the town. Foodies - Feast on fresh fish caught from the river Main and local game. Great walks - Take a stroll through the stunning rose gardens set behind the Neue Residenz. Sights nearby - Visit the Medieval 11th century Bamberg Cathedral. A beautiful hotel in classical style with contemporary elements. Sumptuous rooms and suites have creamy furnishings, subtle lighting and private balconies. Lovely roof top terrace deck, good restaurant, and a lively bar, plus fitness suite and spa. For those who like subtle luxury. Luxury - A classic luxury hotel with contemporary elements. Sights nearby - Close to Prinzregenten Theater and the Munich Philharmonic. A charming traditional property set in stunning surrounds. Contemporary clean lines meet rustic charm in the rooms with use of light woods and splashes of colours coming through in the curtains and bedspreads. An extensive spa and hearty regional cuisine. Plenty of outdoor activities. A rural haven. Families - Superb family friendly accommodation (some suites sleep up to 6) plus endless activities makes this ideal for family holidays. Active Holiday - The Chiemgau region provides a host of outdoor pursuits in both winter and summer months. Swimming Pool - Indoor pool. 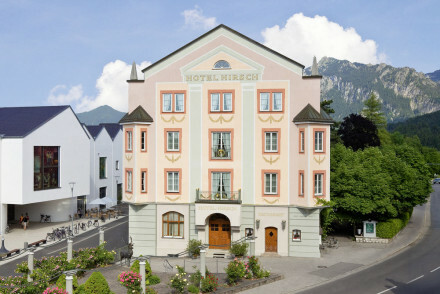 Romantic hotel housed behind a quaint pastel pink facade, in the old town of Füssen. Charming rooms are themed on the region, with antiques and wooden floors, opulent fabrics and plenty of character. Beer garden and Bavarian menu in the good restaurant. A memorable, good value stay. 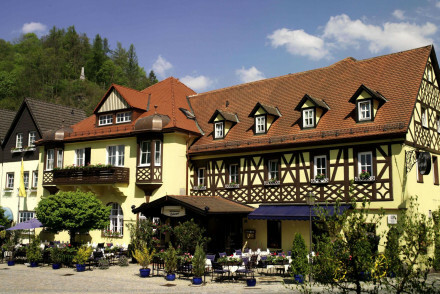 An excellent hotel set in the small Bavarian town of Hohenschwangau. 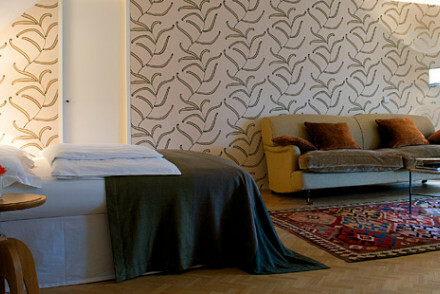 The comfortable rooms are spacious and light with many affording views of Neuschwanstein Castle. Relax at the on site spa, and enjoy afternoon tea on the in the gardens. Historians will love the surrounding castle country. Local exploring - Perfectly placed for exploring this stunning countryside, and visiting the incredible Neuschwanstein Castle. Total relaxation - An enchanting mountainside retreat with Finnish sauna, massage treatments, and a hot tub with castle views. Sights nearby - Castle Hohenschwangau and Neuschwanstein Castle are both less than twenty minutes walk from the hotel. Great walks - There are lovely walks and trails on the nearby Romantic Road. A family-run property in stunning surrounds. Simple cosy rooms with large sash windows and sink-into beds. A gorgeous garden for outdoor breakfasts during the summer. A hearty regional fare is served up in the restaurant. A multitude of outdoor activities in the surrounding area. Totally idyllic. 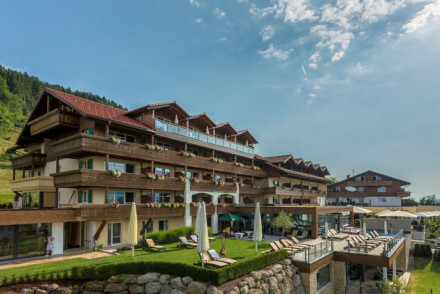 Active Holiday - The perfect landscape for outdoor activities with lake Tegernsee, miles of hiking trials and ski resorts all in the vicinity. Great walks - 180 km of hiking trials to be explored through the surrounding countryside. Perched high a-top a hill this 4-star property offers breathtaking views of the Allgau countryside. Light and airy rooms are simply styled with soft hues, floor to ceiling windows and a choice selection of antiques. Boasting both a spoiling spa and exemplary restaurant. A charming mountain escape. Spa breaks - The wellness centre has a sauna, indoor pool, gym with panoramic views and a range of massage and beauty treatments. Sights nearby - The royal castles of Neuschwanstein and Hohenschwangau are a mere 5 minute drive from the hotel. 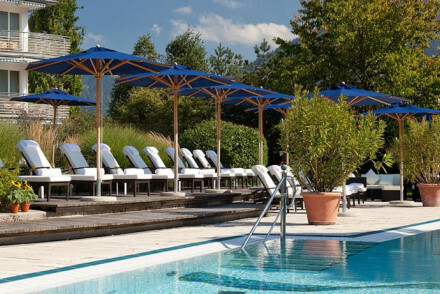 Chic and creative 4-star accommodation in Sankt Englmar with a seasonal outdoor pool, an indoor pool, tennis court, wellness centre and exemplary contemporary restaurant. En-suite rooms mix the old and new in design and the best have mountain views. Ideal for hiking and skiing enthusiasts. Spa breaks - The wellness centre includes a sauna, jacuzzi, gym and wide treatment menu. Business meetings - The hotel has rooms for banquets, seminars, meetings or large gatherings. Great walks - In a valley surrounded by mountains - ideal for walking enthusiasts. In an original Baroque building in the heart of Regensburg's busy pedestrianised old town, the Hotel Orphee is almost more of a restaurant with rooms than an hotel. Excellent and popular brasserie and bar. Eclectic and arty rooms. Local exploring - Right in the heart of the hustle and bustle of Redensburg's old town, minutes from the cathedral and Steinerne Brücke bridge. Local markets - Winter guests must be sure to explore the Regensburg festive markets. Great walks - Head out on foot to explore this fascinating city centre. Sights nearby - Only a five minute walk from the Dom St Peter. 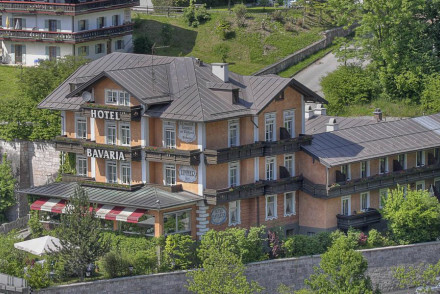 Luxury resort and spa set in a stunning location in the pretty ski town of Berchtesgaden. Minimalist contemporary design meets traditional regional style. Glass fronted rooms lend spectacular views. A Michelin-Starred restaurant for pure indulgence. A glorious and extensive spa. Mountain perfection. Foodies - The hotel houses Michelin-starred Le Ciel as well as an excellent and hearty Bavarian restaurant (best enjoyed with a beer). Active Holiday - The Bavarian Alps are an adventure playground with everything from Germany's highest golf course to paragliding and skiing. Spa breaks - An extensive spa includes a colour therapy and meditation lounge with floating water beds plus seasonal massages. Great walks - Miles of trials to be explored starting right from the hotel door. A family-run property exuding Bavarian charm. Contemporary suites and rooms sit in chic opposition to the quintessentially styled restaurant. Think clean lines, white on white and luxury bathrooms. The regional cuisine is exemplary. Find numerous outdoor pursuits in the surrounding area. Superb. 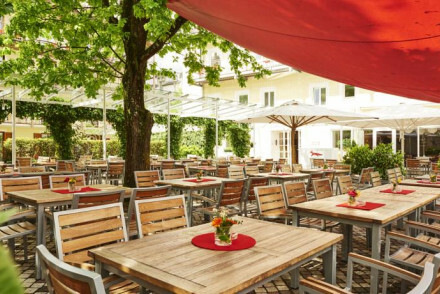 Foodies - Sample Bavarian cuisine with an innovative twist in the restaurant that uses produce often taken from the kitchen garden. Hideaway - Unwind in the picturesque countryside and feast on excellent cuisine and regional liquers. 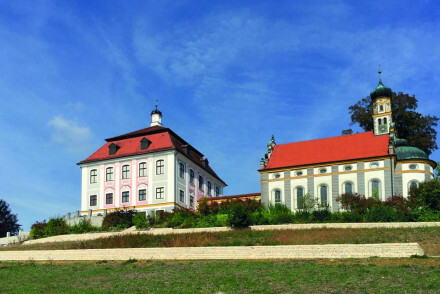 Sights nearby - Make a trip to Nuemarkt to visit the medieval fortifications and former Pfalzgraf Castle. Great walks - Embark on the "Schwarze-Laber-Bikeweg" route along the river Laber. 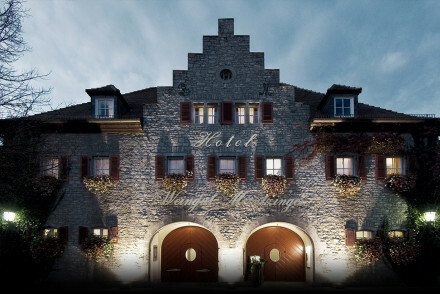 This luxurious 5 star hotel is set in a 13th century castle above the town of Wernberg-Köblitz. The rooms are decorated in an elegant and traditional manner whilst it also boasts a gourmet restaurant on site. Plenty of local activities to keep you busy or, alternatively, relax with a massage! A relaxed, homely bed and breakfast with a warm and welcoming atmosphere. Slightly outside Nuremberg city centre, there is plenty of free parking and the owners are more than happy to offer dining recommendations nearby. Quiet with caring and friendly staff. Families - The perfect spot to base your family, with a lovely garden, babysitting services, and free access to bikes. Great walks - There is a park right across from the hotel, ideal for a morning stroll. Sights nearby - Take the tram right into the city centre and explore the old city. A charming traditional property with lake and mountain views. Cosy mountain rooms with beamed ceilings, wood panelling and traditional fabrics. A small spa to relax and unwind after a day in the great outdoors. A multitude of activities to keep all entertained. A quaint country escape. Hideaway - Set on the banks of a crystal clean lake in the stunning Tegernsee Valley - an idyllic escape. Romantic Break - Enjoy complete tranquility in quaint, traditional, surrounds. Sailing - The lake offers opportunities for a day's sailing with gorgeous scenary. A homely boutique hotel with a fantastic Japanese restaurant. Pine floor bedrooms have killim rugs, private balconies and natural fabrics in earthy tones. A family friendly choice with excellent food and a warm atmosphere. Foodies - Fantastic Japanese restaurant. Local markets - Right next to the Viktualienmarkt, one of Europe's best. Sights nearby - Right in the centre of town. A hotel with the wow factor. Seamless rooms and suites decorated with romantic flair, a Michelin star restaurant, fitness centre, and an unrivalled location in the heart of the city. A destination for the luxury traveller. Good wine list - Famed wine cellar. A stunning country house at the foot of the Bavarian Alps. Top notch spa dedicated to complete rejuvenation, gourmet restaurant serving outstanding local produce, large wine cellar, and eclectic modern Bavarian interior design throughout luxurious rooms. Ideal for spa breaks and foodies. Spa - Five pools, half a dozen saunas and steam baths, and special spa treatments. Foodies - Fabulous cuisine, complex menus, and the freshest of local produce. Hills & mountains - On the edge of the Bavarian Alps, just an hour outside Munich. Spa breaks - The hotel is dedicated to wellness and fresh mountain air. 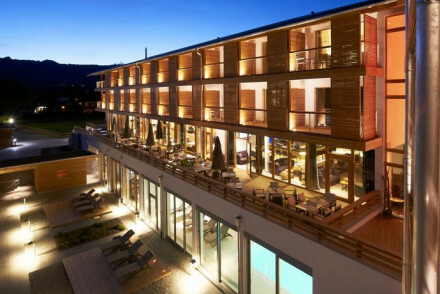 This 5* Alpine style hotel offers designer rooms and suites, a gourmet restaurant and even brews its own beer on site! There are plenty of nearby activities from skiing, hiking, cycling or mini golf, whilst those looking to relax can take advantage of the on site spa and wellness centre. 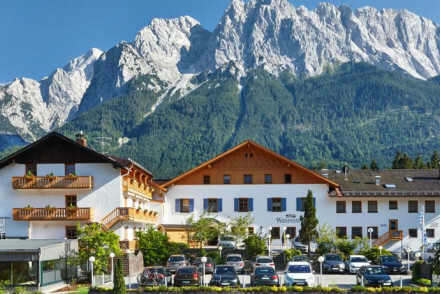 A delightful hotel nestled amongst the stunningly beautiful Bavarian Alps. The spacious, comfortable rooms are adorned with warm wooden headboards and furnishings. Perfectly suited to adventurous holiday makers, the surrounding area is a haven for skiing, climbing and walking. An alpine gem. Country Escape - The perfect country escape in the Bavarian Alps, with fantastic views, gourmet cuisine and plenty of outdoor pursuits. Total relaxation - Refresh mind and body with beauty and massage treatments, as well as whirlpool, sauna, steam room and infrared cabin. Great walks - There are endless beautiful walks around this area. A striking 4 star hotel located next to the Rococo Jewel Schloss Leitheim. Elegant rooms boast high ceilings, wooden floors and antiques. A fire-lit restaurant serves exemplary local dishes and there's an indulgent spa too. Weddings - An fairytale-like setting for an idyllic wedding and the chapel can be used as a wedding room. Spa breaks - The spa includes a gym, steam bath, sauna room and a range of beauty treatments. Sights nearby - Take a stroll down the beatiful Reichstrasse, with its imposing patrician houses, in historic Donauwörth. Stylish 4-star hotel at the foot of the Reichenhaller mountain range, offering bright and spacious rooms designed with natural materials. Unwind in the indulgent spa, book an appointment with the in-house holistic doctor and feast in the fabulous restaurant. A spoiling base for a mountain stay. Spa breaks - There is an indoor pool, a heated outdoor pool, sauna, hammam, gym and a range of treatments on offer. Foodies - Feast on traditional Bavarian cuisine in a gourmet 6-course dinner menu in the restaurant "Genussart". 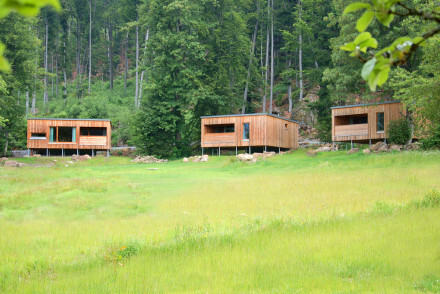 Back to Nature - A perfectly secluded hotel, surrounded by trees and mountains. Traditional Bavarian charm away from the bustle. A modern Alpine chalet with quintessential decoration - wooden panelled bedrooms with handsomely carved wooden beds. The breakfast room carries on the same theme, plus a pretty a Renaissance tiled stove. A really cosy spot. Local exploring - A traditional styled property just 15 minutes from Munich city centre. Local markets - Visit the enormous farmer's market, Viktualienmarkt. Excellent rural German hotel that blends the old with the new, combining traditional and modern interiors. Neumuhle is home to comfortable and spacious rooms with countryside views. The extensive spa is great place to return to after a day's exploring. A great launchpad for exploring rural Bavaria. Great walks - Great walks through the nearby Bayrische Rhön Nature Park. Stylish accommodation in the popular spa town of Bad Fussing, offering bright and spacious rooms designed using natural materials. A spoiling spa boasts a wide range of massage treatments. After a day spent unwinding dine in the fabulous restaurant and admire the spectacular views. Spa breaks - The hotel offers a host of wellness and preventive therapies and places emphasis on health. A treat for all the family in this welcoming hotel. Elegant and cosy rooms have wooden decor and large bathrooms. Indoor whirlpool, outdoor pool, Finnish sauna, terrace, outdoor wooden playground, physiotherapy and fantastic, regional menu in the restaurant. 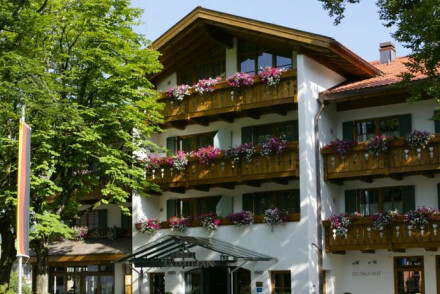 A high quality hotel in the Bavarian town, Garmisch-Partenkirchen. Spacious and stylish rooms with mountain facing balconies. There are a host of alpine pursuits on tap, and the hotel's spa is the perfect sanctuary after a long day. Feast on regional specialties in the restaurant or on the terrace. Total relaxation - Leave all your worries behind at the deluxe hydrotherapy spa, complete with sauna, steam room and outdoor hot tub. Active Holiday - The perfect launch pad for a whole host of alpine pursuits such as skiing, mountain biking and trekking. A chic hotel and spa set at the foot of the Alps. Cosy rooms feature alpine furniture, warm hues and sink-into beds. Unwind in the spoiling spa, take advantage of the indoor and outdoor pools and spend days exploring the beautiful countryside. An ideal base for exploring the region. Spa breaks - The spa has a pool, sauna, jacuzzi, massage facilities, a hammam and a range of beauty treatments. Active Holiday - The surrounding countryside plays host to a plethora of outdoor pursuits. Sights nearby - A short drive from Oberammergau, a picturesque town made famous for its ornate facades. 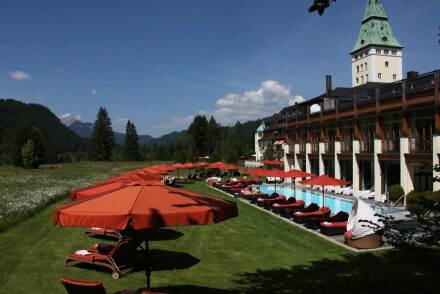 Exceptional 5* in fairytale Bavaria providing the ultimate in elegance and fine dining. Here, the vision of 3-starred chef Heinz Winkler combines culinary excellence with wellness. Rooms and suites blend luxury and local charm. Gourmet restaurant offers incomparable food and a wine list to die for. Set within an 11th century castle this hotel is steeped in history with a modern touch. Rooms are decorated in a country-style with original brickwork and bathrooms with huge tubs. Charming garden for dining or relaxation plus a sauna in the former cellar. Gothic-style restaurant with good menu. An elegant hotel, designed for relaxation and boasting stunning views. Contemporary rooms feature plenty of natural materials; the best have a mezzanine. An indulgent spa is ideal for relieving stress. A choice of four restaurants showcase the regions' cuisine. A heavenly spot to completely unwind. Total relaxation - Breathe in the fresh air and unwind in the pool, sauna or over a massage. Sights nearby - Munich and Salzburg are both within an hours drive. 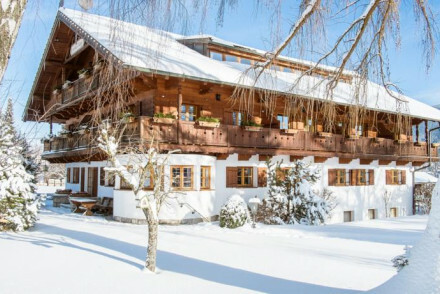 A charming mountain retreat, in the picturesque Allgäu Alps. Elegant and suave suites, with private balconies overlooking the valley. The Michelin starred in house restaurant, Maximilian, serves creative cuisine in a relaxed setting. The perfect mix of contemporary style and homely vibes. Foodies - The hotel's restaurant has been awarded a Michelin-star for its innovative regional and international cuisine. Active Holiday - From skiing to biking, hiking and golfing there is something for everyone. Great walks - This area is famed for its hiking trials, take a guided tour or head off on your own steam. A tranquil resort with stunning Alpine views. Light and airy contemporary rooms with wooden features, crisp white linen and soft hues. An extensive spa for all kinds of relaxation. gourmet cuisine and an excellent wine list. Numerous outdoor pursuits. The ideal spot to come and completely unwind. Spa breaks - A glorious spa with indoor pool, hammam, extensive treatment list, yoga, meditation and excellent wellness packages. Romantic Break - Relax and unwind together in this peaceful property. Sights nearby - Cross-country and Alpine skiing is possible during the winter months. A quirky theme hotel with a number of individually created bedrooms that each tell their own story. The hotel has a bright, neon lit cocktail bar and offers breakfast only. Centrally located, there are lots of restaurants to choose from nearby and top city sights on the doorstep. City Style - Centrally located, just minutes from Hauptmarket square with achingly stylish rooms chronicling legends and tales of Nürnberg. 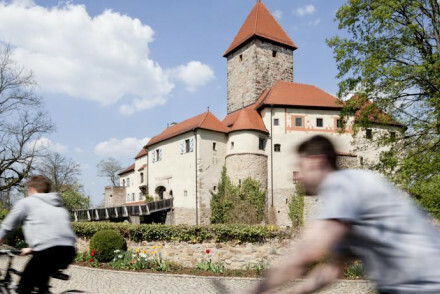 Sights nearby - Visit the stunning Kaiserburg castle, a historic sandstone castle dating to the Middle Ages. Great walks - Head to the nearby Skulpturengarten, a charming outdoor sculpture museum. Local markets - Just minutes from the beautiful medieval market square of Hauptmarkt. Charming family-run 4-star accommodation in the village of Kalkenried, nestled in the Bavarian Forest Nature, offering cosy traditionally-furnished rooms. Boasting an award-winning restaurant, spa facilities and heated indoor and outdoor pools. A rejuvenating stay. Spa breaks - The wellness centre includes an indoor pool, sauna, steam bath, saline bath and foot spa. Foodies - The award-winning restaurant sources meat from its own butchers. Great walks - Situated in the middle of the Bavarian Forest Nature Park. Seriously opulent Five Star hotel, only for the luxury traveller. Behind a traditional facade are elegant rooms and suites, restaurants, a bar, and a fabulous spa. All accompanied by private butlers, personal shoppers, and limousines, if you wish. A glorious lakeside property with elegant contemporary interiors. Light and airy rooms feature fabulous views - the best have private balconies. Two pools, a spoiling grown-up spa plus excellent gourmet cuisine and numerous outdoor activities. The ideal property to revel in complete tranquility. 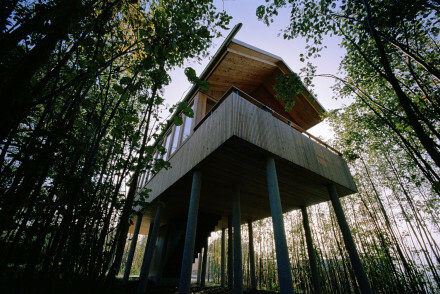 Hideaway - A luxury lakeside hotel complete with a gorgeous spa. Sailing - Excellent wind conditions for sailing enthusiasts. Reasonable rates at a colourful, boutique-esque hotel with sophisticated designer edges. Modern paintings, sculptures and jazzy coloured lights create sleek interior spaces. 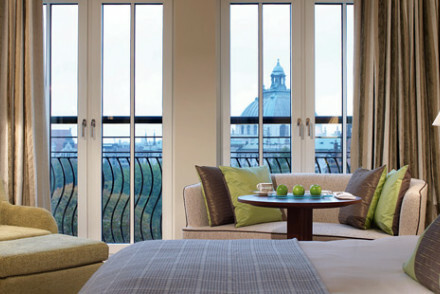 Fantastic views of the city from the top suites, to be enjoyed from two private balconies. Trendy restaurant and bar too. 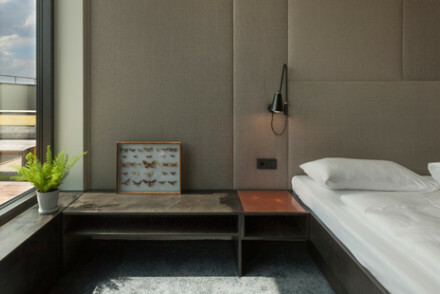 City Style - A contemporary boutique hotel in Karlstor, with chic teak flooring, black granite details and design furnishings. Great walks - Take a stroll down to the nearby Hellabrunn zoo, great for kids. Sights nearby - Walking distance from the imposing Frauenkirche church. A chic luxury hotel boasting gorgeous mountain views. Contemporary rooms feature floor to ceiling windows and large private terrace. A well-equipped wellness centre is completely spoiling. The cosy restaurant serves up exquisite modern regional cuisine. A smart hotel for a rejuvenating stay. Active Holiday - The mountains provide a plethora of activities to keep everyone from ramblers to adreneline junkies occupied. Skiing - Take advantage of the 77 mile-long network of trails at the Oberstdorf-Kleinwalsertal ski resort. Total relaxation - Rejuvinate in the mountain air or with a massage in the glorious spa. A glorious lodge in the stunning Allgäuer Mountains. Light rooms use traditional materials yet have a contemporary feel. The best rooms have window-side in room wooden baths. Gourmet cuisine is enjoyed with wonderful mountain views. The spa is the icing on the cake. Ideal for a rejuvenating stay. Romantic Break - Stunning contemporary rooms some with in room wooden baths. Great walks - Take on a challenge and take a Nordic Walk on one of the many trails. Contemporary Five Star Forte hotel. Crisp, elegant rooms and suites with parquet floors, cream furniture and private balconies. Fantastic Italian restaurant, extensive spa, and lovely terraces. Luxurious, but grounded. Foodies - Excellent Italian restaurant. One of Europe's finest hotels. An iconic FIve Star in central Munich. Luxury on a grand scale includes sumptuous rooms and suites (with terraces, spa, views), multiple restaurants including a Michelin starred, roof top spa, private cinema, night club, and lively bars. For the luxury traveller. Spa breaks - The iconic spa has a 13,000-square-foot rooftop spa offers a pool, saunas, steam bath, sun deck and fitness studio. Foodies - Six restaurants including Michelin-starred Atelier. 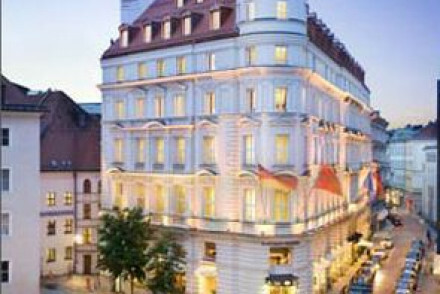 City Style - One of Munich's most legendary hotels. Five stars for luxury, service, location and food at this stunning city hotel. Outstandingly situated next to a hive of cultural activities. Immaculate contemporary, but subtle, decoration with Asian influences. 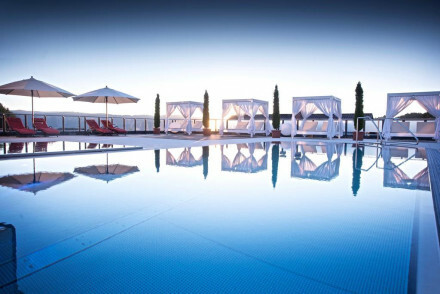 Unrivalled views from the rooftop pool and a Michelin-starred restaurant. Magnificent. An impressive resort and spa run with all the slick precision of a luxury hotel. Set in a valley below the Bavarian Alps. Contemporary, well-appointed rooms with glorious views. Numerous spas separated into family and adult only. Three restaurants including Michelin Starred Luce D’Oro. Perfection. Spa breaks - Adult and family spas, a hammam, outdoor pool, sauna and steam room - to name a few. Romantic Break - A glorious, tranquil, getaway to unwind and spend some time together. Families - An award winning kids club to keep little ones occupied. Great walks - Miles of tracks to explore through the surrounding mountains and forests. Tranquil, modern private villas in woodland. Contemporary bungalows themed on the four elements, larger houses have kitchens. Freshwater lake pool, two saunas, outstanding spa treatments. Two restaurants, cooking courses and plenty of fresh air activities. The ultimate destination to switch off.